The Lava Shells ‘Spa-At-Home’ Self-Heating Massage Kit available for under £25! 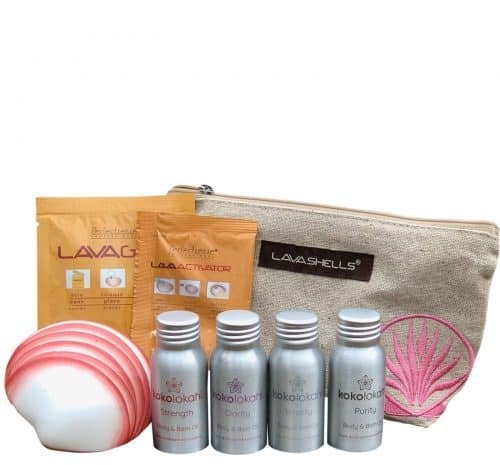 To celebrate the run up to our tenth birthday celebrations and an increased interest in our Lava Shells ‘Spa-At-Home’ Kit, we have a limited number available to purchase for just £24.50 plus VAT at the Olympia Beauty Show. Find us on Stand B10. Dubbed the “New Hot Stones”, Lava Shells have fast become the most sought after heated massage treatment in the beauty and wellness industry. The World’s first self-heating massage tool, the Lava Shell uses a natural, biodegradable heat technologyto deliver a unique and innovative therapy that offers a seamless massage of warmth and touch. While the gentle heat radiating from the Lava Shell helps to melt away aches and pains, the ergonomic design works naturally with the body’s muscles to release tension, stiffness and induce a feeling of deep relaxation and calm. Taking the Lava Shells experience one step further, the at-home spa experience can be enhanced with Shared Beauty Secrets’ own exclusive brand of exotic, indulgent and enchanting Body & Bath Oils, kokolokahi – natural and vegan-friendly. Each Oil has been passionately blended with the finest aromatherapy essential oils to evoke an emotion and to improve one’s mind, body and soul. TheLava Shells ‘Spa-At-Home’ Self-Heating Massage Kit offers a great retail opportunity for salons and spas. With Lava Shells treatments widely available across the UK in over 2,000 leading spa and hotel locations, the “Spa-At-Home” product enables your clients to complementtheir professional Lava Shells treatments in their own home. Packed in a gorgeous natural woven pouch, the Lava Shells ‘Spa-At-Home’ Self-Heating Massage Kit is practical for both home use as well as to travel with. It is perfect to have in a bag and heats up in five to ten minutes to give a much-needed uplifting massage on the go! To ‘see the beauty and feel the heat’ visit us at Stand B10 and find out more about the Lava Shells ‘Spa-At-Home’ Self-Heating Massage kit, ourprofessional Lava Shells training and our exclusive Show offers. I cannot get to the show this weekend – Am I still able to order these?